An opening flashback details the early days of Superman on Earth 0. Superman has worked behind the scenes, but deems it necessary to deal with the problem of Blanque, head-on. Blanque has destroyed an entire town. Superman stops Blanque, but is concerned with how to contain the villain, as he's escaped every prison he's been placed in. The story returns to the present, where Superman and Lois Lane discuss Intergang's threat to their secrecy. They both agree that despite the threat, Lois should soldier on with her work. After being certain that Jonathan's bus arrives to school safely, Superman ventures to his Fortress of Solitude, where he inspects one Hank Henshaw, whom he's taken from the Excalibur. However, Blanque, who has been secured in the Fortress for some time, takes control of Henshaw telepathically, and moves to be released. In California, Manheim executes his underlings for failure, while even further away, a Dominator is slain while the quest for the Oblivion Stone continues. Story - 4: More good news and bad news for you lot. Once again, Superman: Lois and Clark turns in another solid, entertaining issue. There's a marked difference in the manner that Jurgens approaches his story and Superman, as opposed to what readers have been given with that alternate fellow. In three issues Jurgens has successfully built a world around Superman on this foreign Earth. It's a world that includes a wife and son, a purpose, a mission, even setting in the form of a reduced Fortress of Solitude. A discerning reader can feel Jurgen's time with Superman continues to be fun, but there is still the desire to explain and create. 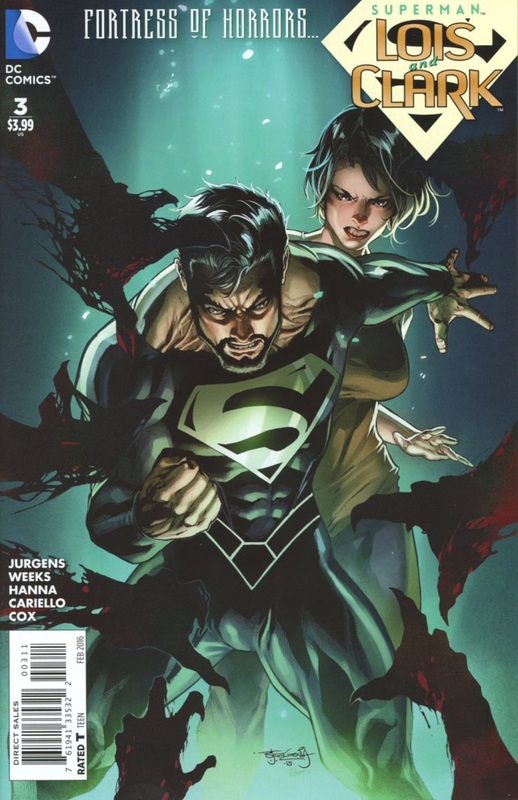 This scenario with Superman on a world with his doppleganger is incredulous to say the least, but Jurgens works strongly to emphasize the aspects of the story that will help readers come along: the relationships between the characters, the actions they perform, and the legacy that Superman has on this planet or any other. It's telling to hear that Blanque was a problem on Earth 0, and one that was worse than any Superman encountered previously. While the hyperbole is noted, the question raised is why no other hero stepped up to the plate? Blanque and the destruction he causes to Rusty Ridge, isn't singular. He's been at this before, so why hasn't he drawn the attention of another Kryptonian, dressed in a facsimile of the true outfit? Why hasn't he drawn the attention of anyone else for that matter? It would be a nagging question, but the New 52 heroes and heroines have been treated as works-in-progress, fractured items that one day may fulfill their potential, so it's not surprising that a villain like Blanque could exist and cause such death and destruction with that lot on the job. It does make one wonder if this is sly commentary on Jurgens' part, and the lacking nature of the New 52 world that's been created, but whether it is or not, it's disturbingly fitting of what has been offered from the rebooted heroes, and Superman in particular. That being said, for all the good and great things that Superman: Lois and Clark is producing for Superman, it's not even in the Top 100 books as of its second issue. I never expected it to surpass the sales of Action Comics or Superman, but definitely better than it's been shown as of its second installment. I know a lot of readers who are sitting out DC Comics since the New 52, and decided to ask what was their resistance to the book. The response? Why get involved with a book that's only going to last 8 issues, and where they'll probably get rid of Superman for the "imposter". I had first heard that the book's run would be for 12 issues. Now, it's down to 8? Will it be 6 by next month? That not withstanding, DC has unfortunately sown a massive amount of distrust on the part of too many readers, the "core audience" that Jim Lee himself acknowledges has been neglected. Well, unfortunately, they're not buying... which is unfortunate. However, I can't disagree with their position totally. What happens to Superman when the clock ticks down and the run is over? Jurgens is doing a lot of building, but does anyone honestly believe that TPTB will choose Superman over the construct that they've created and pushed for the last 5 years? Art - 4: Lee Weeks powers through this issue, with iconic shots of Superman, and bucolic stills to boot. Cover Art - 5: I would really like to see what this duo could do on interiors. The colours are definitely a boost, but even Superman's beard seems to crackle.